Did you know that table football is a Spanish invention? Surely many times you have played this table football but you have rarely done it online on the PC as we bring it to you today. Use the arrow keys to move the row of players from top to bottom to hit the ball and score a goal. 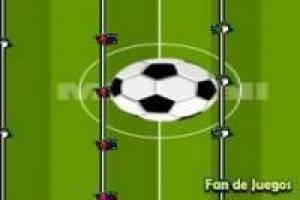 Live all the intensity of this table football league and win the victory in each and every one of these football matches. The most difficult thing will be to control the goalkeeper but soon you will become a professional. Enjoy the game Football, it's free, it's one of our football games we've selected.